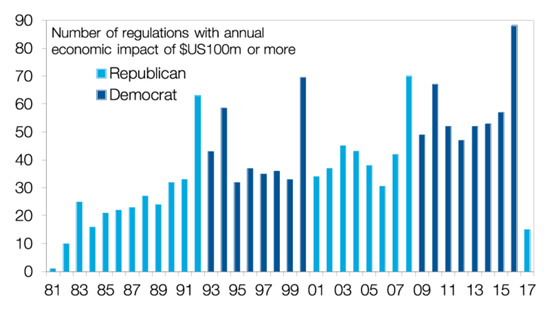 - So far President Trump has been positive for share markets but this year the focus is increasingly shifting to populist policies with greater risk for investors. - The key risks to keep an eye on in this regard relate to trade conflict and the expanding US budget deficit, although the latter is more a risk for when the US economy next turns down. News of a deal between the US and the EU to work towards zero tariffs on industrial goods is good news in terms of heading off a full-blown trade war between the two, but negotiations have a long way to go. There was hope of a deal with China in May – with Trump initially crowing about a May 20 trade deal, but since then both China and the US have dug in with Trump tapping popular support for protectionism and anti-Chinese sentiment. So, the trade threat could get still worse before it gets better which means it risks taking the edge off economic growth. Modelling by Citigroup of a 10% tariff hike by the US, China and Europe showed a 2% hit to global GDP after a year. Of course, we are not seeing a tariff hike on all goods but the impact could still be significant if negotiations with the EU and China fail and all the tariffs being talked about are implemented. 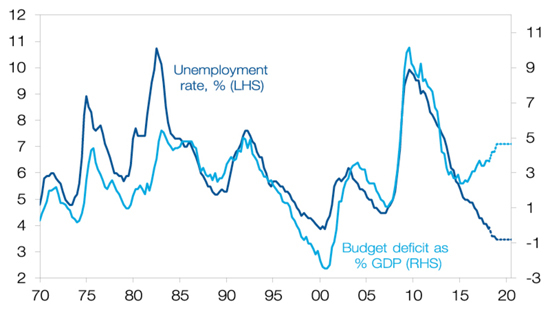 It’s been the norm for the US budget deficit to blow out when unemployment rises (as tax revenue falls and jobless claims go up) and decline when unemployment falls. Thanks to Trump’s fiscal stimulus it’s now blowing out when unemployment is collapsing and looks to be on its way to 5% of GDP. This raises three risks. First, it may mean higher than otherwise interest rates and bond yields as the Fed may have to raise rates more than would otherwise be the case to stop the economy overheating and the Government’s competition for funds results in higher bond yields. 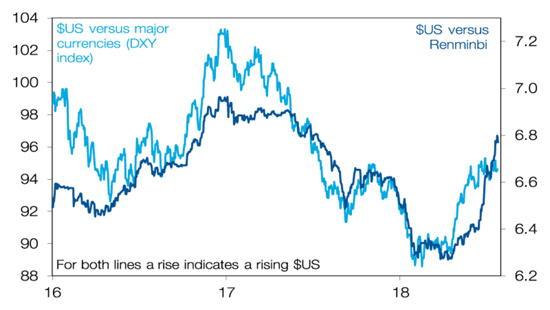 So far there is not a lot of evidence of this with US bond yields remaining relatively low – presumably held down by low global bond yields and trade war fears – but it’s still a risk as US inflationary pressures rise. Important note: While every care has been taken in the preparation of this document, AMP Capital Investors Limited (ABN 59 001 777 591, AFSL 232497) and AMP Capital Funds Management Limited (ABN 15 159 557 721, AFSL 426455) make no representations or warranties as to the accuracy or completeness of any statement in it including, without limitation, any forecasts. Past performance is not a reliable indicator of future performance. This document has been prepared for the purpose of providing general information, without taking account of any particular investor’s objectives, financial situation or needs. An investor should, before making any investment decisions, consider the appropriateness of the information in this document, and seek professional advice, having regard to the investor’s objectives, financial situation and needs. This document is solely for the use of the party to whom it is provide.